1981-1988 Ysgol Gyfun Gymraeg Glantaf (Glantaf Comprehensive School) Cardiff. August 2007. Glassworks begins production. June - August 2004. Glassmaking assistant on Salviati Meets London II. Initial prototyping - hot & cold processing for designers Jane Dillon & Tom Grieves. Exhibition at Vessel - Notting Hill, London. September 2004. March 2003. Purchase of property with Gareth Wynn to house Glassmaking Studio and Gallery in Brecon, South Wales. Full renovation and restoration project. Work completed April 2005. June 2002. Kathryn Roberts Glass temporarily moves to Cardiff, South Wales. January 2002. Addition of MEZZO Bowl Design into Dartington 2002 Crystal Collection. October - December 2001. Part Time Instructor and Tutor in Glass. DeMontfort University, Leicester. BA (Hons) Ceramics/Glass. April 2001. TA to US Glass Artist - Ruth King. CGS Masterclass and Conference.Dartington Crystal, Devon. Summer 2000. Senior Assistant on special prioject Salviati Meets London. Prototyping work with Anish Kapoor, Tom Dixon, Nigel Coates, Simon Moore and Tord Boyjte. Production of the work in the Salviati factory in Murano - Venice and all cold finishing of the final pieces. Exhibition at Vessel - Notting Hill, London. 1999 - May 2002. Set up London based Kathryn Roberts Glass. Selling Glassmaker, Cutter and Artist. Freelance Prototype and Design work. February 1998 - June 2001. Part Time Instructor and Tutor in Hot Glass. Staffordshire University. Stoke-on-Trent. BA (Hons) Glass. 1996-1999. 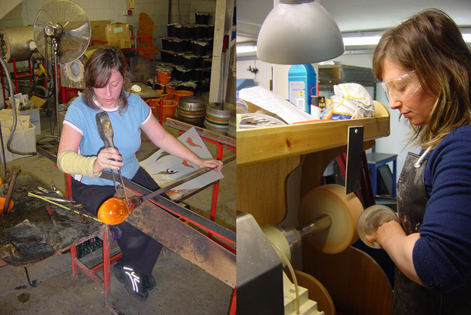 Freelance Glasmaker and Cold Glass Finisher in the London area. Clients include Simon Moore, Anthony Stern and Catherine Hough. February 1994 - October 1996. Senior Assistant Glassmaker at Simon Moore (London) Ltd. Making assistant as well as PA/PR, International Trade Fair sales experience. Antique Restoration, Commissions and Special Projects. Summer 1990. General Assistant to Glassmaker Bob Crooks at his First Glass studio. Newent, Gloucestershire. Commissioned by Brecon International Jazz Festival to design and produce a special Lifetime Achievement Award - presented to Dame Cleo Laine and Sir Jonny Dankworth. August 2008. Commisioned by Eisteddfod Genedlaethol Fflint a’r Cylch, 2007. Menter a Busnes Trophies(design & manufacture). Presented August 2007. Commission for bespoke trophy (design & manufacture) for European Cities Tourism Awards. Presented in Helsinki, June 2007. Commission for bespoke lighting project (design & manufacture) for Casa Foa Exhibition Argentina November 2005. Collaboration with attic 2, Cardiff. Commission by BBC & WDA through Merlin Marketing - Cardiff to Design and Manufacture the Trophy for The BIZ Awards 2003. Sept 2003. Craft in the Bay, Makers Guild of Wales, Cardiff. Guest Maker Solo exhibition December 08 & Jan 09. Winter Exhibition, Cowdy Gallery, Newent, Gloucestershire (Guest Maker) 18th Oct - 13th Dec 08. Welsh Artisit of the Year 2008. St Davids Hall Cardiff June - July 08. Bovey Tracey Craft Fair, Devon. June 2008. British Craft Trade Fair, Harrogate, Yorkshire. April 2008. Wonderculture. Chapter Arts Centre. December 2007. Origin 2007. Craft Council. Selected exhibitor. Somerset House, The Strand, London. October 2007. Craft Showcase. Llantarnam Grange Arts Centre, Cwmbran. June - July 2007. Wales Week. Showcase - Time Warner Building, New York City. USA. February 2006. New Glass exhibition at the Craft Centre & Design Gallery, City Art Gallery, Leeds. May 2002. East London Design Show. Shoreditch Town Hall. June & December 2001. New York Internatioal Crafts Fair. British Crafts Council. January 2001. Chelsea Crafts Fair 2000. Chelsea Town Hall - London. October 2000. MODE Design Show. The Business Design Centre - London. May 2000. Sub-Urban Exhibition. Instillation at Gloucester Road Tube Station. London. March - April 2000. Con Graduated 1998. Glassmuseum - Ebeltoft, Denmark. Nov 98 - Jan 99. New London Glass. Candid Art Gallery. Islington, London. October 98. The Show: Fine and Applied Art. The Royal College of Art -London. Graduation Show. June 98. 100% DESIGN Show 98, Holland, France, Germany, Bulgaria. Green Exhibition. The Designers Guild Shop /Showroom. Kings Road, London. Spring 98. Television item on Sioe Gelf program in the welsh Language for S4C. Wales. Feature Article. Gate Gallery & Glassworks. November 2007. Television item on Crefft program in the Welsh language for S4C. Wales. Featuring Sub-Urban Exhibition. Broadcast March 2000. Homes and Gardens Magazine. April 2002. Feature title: Heart of Glass p 52-56. Glass- an inspirational portfolio. By Jeru May Morton. Book Published by Watson-Guptill Publications. 1999. Photographed demonstrating glassmaking techniques. The Glass Calender 1999. Distributed to all Foreign and Commonwealth Offices worldwide. The Independent Newspaper - Saturday Magazine. Article entitled A Glass Act. Saturday June 27th 1998. pages 40-43. Ebeltoft Glass Museum Denmark. Piece entitled Inside=Outside acquired 1998 - Permanent Collection. Creative Wales Award. Arts Council of Wales. Financial assistance for prototyping and basic marketing. January 2005.
Business Development Grant. Powys County Council. Assistance in purchasing manufacturing equipment. 2005. Northlands Creative Glass Centre Summer Residency Scholarship 1998. Lybster, Scotland. September - November 1999. Leerdam Summer Glass Workshop. Holland. August 1998. RTZ Travel Award. Financing for travel in the U.S.A. 1997. UK Leeds City Art Gallery& Design Centre. Coiterie, Haverford West, Pembrokeshire .Vessel, London. Roberts & Co, London. Cowdy Galley, Newent Glos. Oriel Makers, Cardiff. Liberty, London. Crafts Council Gallery Shop, London. Icon, Brighton. Taurus Gallery, Oxford. Oriel Makers, Cardiff. Llantarnam Grange Arts Centre, Cwmbran. USA Gumps, San Francisco. Barneys New York, Los Angeles &Chicago.Tiny Jewel Box, Washington. Lanngham Gallery, P.A. Flora, MA. WORLDWIDE Art it is Ltd, Hong Kong.